Then-Major Charles Kettles, in a series of harrowing acts, saved the lives of 40 soldiers and four of his own crew members in Duc Pho on May 15, 1967. Decades later, he was awarded the Medal of Honor by President Obama. Retired Lt. Col. Charles Kettles, a Medal of Honor recipient and Vietnam War veteran, died Monday. He was 89 years old. Kettles, a native of Ypsilanti, Michigan, is most remembered for his daring rescue under enemy fire of U.S. Army troops deep in the jungles of Vietnam. He was credited with saving the lives of 40 soldiers as well as four crewmembers of a damaged UH-1D helicopter. “We got the 44 out. None of those names appear on the wall in Washington. There’s nothing more important than that," Kettles said, according to the 101st Airborne Division, when he finally received the Medal of Honor. Kettles originally received the Distinguished Service Cross for his actions. However, the award was upgraded to the Medal of Honor in July 2016, after a campaign to recognize his actions that included letters from Kettles' company comrades validating his actions and legislation by Congress to waive a time limit for the award. Kettles' passing was made public by the Congressional Medal of Honor Foundation Tuesday. “It is with a heavy heart we say that we have lost another amazing American hero. Medal of Honor Recipient Charles Kettles passed away on Monday," the foundation wrote in a Facebook post. Kettles' military career began at the age of 21, when he was drafted into the Army while enrolled in college in Michigan. After basic training, Kettles attended Officer Candidate School at Fort Knox, Kentucky, and earned his commission before graduating from the Army Aviation School in 1953. He served active-duty tours in Korea, Japan and Thailand. 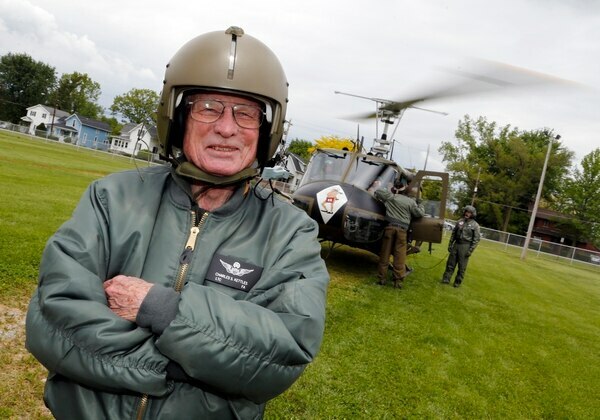 He returned to Michigan and continued service in the Army Reserve until he returned to active duty in 1963, when the U.S. was in need of pilots during the Vietnam War. Kettles was trained on the UH-1D “Huey” helicopter and sent to Fort Benning, Georgia, in 1966. As a flight commander with the 176th Assault Helicopter Company, 14th Combat Aviation Battalion, Kettles deployed to Vietnam for the first time from February through November 1967. Roughly four months into that deployment, Kettles fought in a battle that would one day be recognized as worthy of his nation’s highest military decoration. In the early hours of May 15, 1967, soldiers from 1st Brigade, 101st Airborne Division, were ambushed along the Song Tra Cau riverbed in Vietnam’s Duc Pho district by a North Vietnamese Army battalion. The American brigade was raked with automatic weapons, machine guns, mortars and recoilless rifles — all reportedly fired from an NVA complex of deeply fortified tunnels and bunkers. The U.S. troops found their suppressive fire to be ineffective against the web of entrenched NVA soldiers, according to the Army’s historical narrative of the events. Upon hearing of 1st Brigade’s fate, then-Maj. Kettles volunteered to lead a flight of six Huey helicopters to carry reinforcements to the battlefield and evacuate the wounded. The sortie came under fire from multiple directions upon approaching their landing zone. “Soldiers were hit and killed before they could leave on the arriving lift helicopters,” the Army’s narrative of events reads. Fighter jets peppered the ridges overlooking the landing zone with the controversial petrochemical napalm and other munitions. But the ordnance provided little relief for the helicopters. Even as small arms fire and automatic weapons raked the landing zone and helicopters, Kettles refused to leave until all troops and supplies were off-loaded and all the casualties were brought aboard. Kettles then led his helicopter flight back to the staging area before returning once again. Upon landing the second time, the gunner on his Huey was seriously wounded, and his aircraft was severely damaged. Another helicopter crew advised Kettles that fuel was streaming out of his helicopter. Kettles' crew could have dumped the aircraft there and evacuated on another Huey, but instead he expertly piloted it back to the staging area once more. Despite the reinforcements and supplies, the infantry battalion commander would eventually request an emergency extraction of the 40 remaining U.S. soldiers still near the ambush site along the Song Tra Cau riverbed. Four members of Kettles' unit were also stranded on the battlefield after their helicopter was destroyed by enemy fire. Only one Huey from the original flight was still flyable by this point, according to the Army narrative. 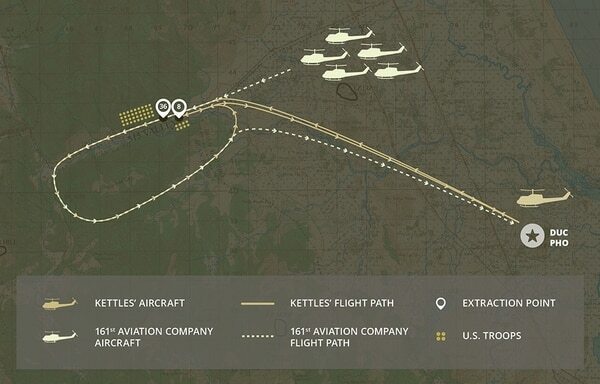 Kettles volunteered to fly it to the landing zone for a third and final time, leading a flight of six evacuation helicopters, five of which were from the 161st Aviation Company. The flight landed, extracted the troops and departed the landing zone. Of note, the gunships covering the evacuation departed the area as well. But once airborne, Kettles was told that eight U.S. soldiers had been left behind. They were unable to reach the evacuation point due to intense enemy fire. Kettles then passed flight leadership to another pilot and returned to the landing zone to rescue the stranded troops. No gunship, fighter jets, artillery, or any other support was there to suppress the enemy fire. All NVA soldiers were concentrating their munitions on the lone Huey. 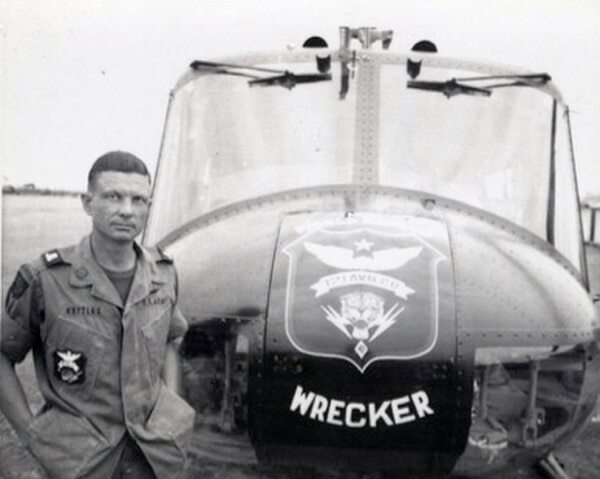 Kettles' helicopter was immediately hit by a mortar round that damaged the tail boom, a main rotor blade, shattered both front windshields and the chin bubble. It was further raked by small arms and machine gun fire. “Despite the intense enemy fire, Major Kettles maintained control of the aircraft and situation, allowing for the remaining eight soldiers to board the aircraft,” a White House transcript from Kettles' Medal of Honor ceremony reads. “In spite of the severe damage to his helicopter, Major Kettles once more skillfully guided his heavily damaged aircraft to safety." “Without his courageous actions and the superior flying skills, the last group of soldier and his crew would never have made it off the battle field,” the transcript reads. Kettles made it home that day, as did the 44 other Americans. He would go on to serve again in Vietnam in October 1969 until October 1970, before being posted to Fort Sam Houston in San Antonio, Texas. There, he served as an aviation team chief and readiness coordinator supporting the Army Reserve. He remained in San Antonio until his retirement from the Army in 1978. Kettles later worked for Chrysler Pentastar Aviation until his retirement in 1993. Prior to his death, the Army said, Kettles resided in his hometown of Ypsilanti with his wife Ann.